Al Prodgers is one of SA's Best Corporate Entertainers, Stand up Comedians and MC. If you're looking for a top-notch Corporate Entertainer, Stand up Comedian or MC for your Corporate event or function, we invite you to seriously consider Al Prodgers. Al Prodgers has regularly appeared on international comedy stages from Seychelles and Mauritius to sophisticated venues in London, UK. He has entertained audiences in Dubai and Abu Dhabi and worked in Windhoek, Maputo, Gaborone Zambia and Uganda at home on the African continent. Al Prodgers achieved notable success as a finalist at the Yuk Yuks Great Canadian Laugh Off (2007), an international comedy competition in Toronto with thousands of entrants from around the world. Al won all the way through to the grand final, the last round of 8 comics. He is the only non-Canadian act to have made it to the big clincher. 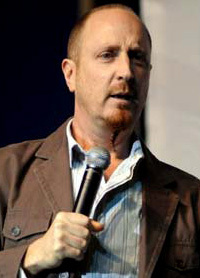 In 2002, Al Prodgers hosted the comedy festival, "Stand up South Africa" in London and won excellent reviews for his hilarious explanation of his homeland to intrigued international spectators and homesick expatriates alike. When legendary US comedian, Steven Wright toured South Africa, Al Prodgers was chosen to support him in Cape Town. -Al Prodgers regulary performs on major stages throughout South Africa, including the 2010 Vodacom Funny Festival in the Baxter Theatre Concert Hall, Cape Town. -In 2008, Al featured on the Johannesburg Arts Alive Festival comedy bill. He has performed in this hugely popular event every year since 2005. -He thrilled the crowd at the 94.7/Rapport Raw Rocks Festival in the Sun City Super Bowl this year. -He’s been a regular at the Smirnoff International Comedy Festival and has had successful solo shows at the Grahamstown Festival Fringe. -Al is a popular feature at the King Size Comedy Jams in major centres around the country. -In 2006, he flew the flag in Durban at the East Coast Radio Comedy Invasion Tour with visiting Australian and British comics. Al Prodgers presents, FuelDuel, a reality show being broadcast on Mindset Learn, DSTV. Al Prodgers co-hosted the SABC 3 actuality programme, Zooming in on Men. His performance at the Yuk Yuks Great Canadian Laugh Off was filmed for the highly rated channel, “The Comedy Network” and viewed across North America. Other appearances include Comedy Showcase and The Barry Hilton Show as well as an ongoing comic character (Maxime) on Africa’s most watched soapy, Generations. For variety, he also played a homicidal maniac on Isidingo. Most recently, Al undertook a national, 5-city tour to launch Cadbury’s Local & Lekker chocolate. Al Prodgers also entertained delegates from more than 27 countries at the Coca Cola East African Bottlers Conference. Al Prodgers is an experienced emcee for multi-day conferences. Blue chip clients include Edcon/CNA and Volkswagen South Africa. He has worked for market leading communications companies such as The Blue Moon Company and VWV.